Background It is standard practice to review all patients following discharge at a follow-up clinic but demands on all health services outweigh resources and unnecessary review appointments may delay or deny access to patients with greater needs. Aims This randomised trial aimed to establish whether a virtual outpatient clinic (VOPC) was an acceptable alternative to an actual outpatient clinic (OPC) attendance for a broad range of general surgical patients following a hospital admission. Patients and methods All patients admitted under one general surgical service over the study period were assessed. If eligible for inclusion the rationale, randomisation and follow-up methods were explained, consent was sought and patients randomised to receive either a VOPC or an OPC appointment. Results Two-hundred and nine patients consented to study inclusion, of which 98/107 (91.6%) in the VOPC group and 83/102 (81.4%) in the OPC group were successfully contacted. Only 6 patients in the OPC group and 10 in the VOPC group reported ongoing issues. A further follow-up indicated 78 of 82 (95%) VOPC patients were very happy with their overall experience compared with 34/61 (56%) in the actual OPC group (p<0.001). A significant proportion of both cohorts—68/82 (83%) in VOPC group and 41/61 (67%) in OPC group (p = 0.029)—preferred a VOPC appointment as their future follow-up of choice. Conclusions The majority of patients discharged from a surgical service could be better followed up by a virtual clinic with a significant proportion of patients reporting a preference for and a greater satisfaction with such a service. The surgical outpatient clinic (OPC) is the first point of contact between most patients and the surgical team, where they are assessed, investigations ordered and treatment plans devised. Following surgery or non-surgical treatment, it has been standard practice to review all patients at a follow-up clinic visit1–3 but the value of this practice has been questioned for a variety of reasons. The waiting time to access such a service is a commonly measured key performance indicator (KPI), with defined target waiting times in different national healthcare settings.4 5 Current clinical demands outweigh available resources and these targets are often missed. Unnecessary review appointments for patients who are well have the potential to increase adverse healthcare outcomes by delaying access for assessment and diagnosis of patients with more serious conditions.6 7 Routine OPC follow-up is also a burden on patients and relatives, who may miss work or college, have to travel long distances and wait for prolonged periods to be seen. There is also an associated financial burden of absence from work and other costs relating to transport costs and hospital parking charges. The aim of this randomised trial was to establish whether a virtual outpatient clinic (VOPC) was a safe and acceptable alternative to clinic attendance for a broad range of general surgical patients following a hospital admission. A randomised controlled trial was conducted at a government funded and University affiliated teaching hospital in Dublin, Ireland. The hospital provides a a 24 hour emergency department, acute surgical, medical and psychiatry services, day care, outpatient care, long-stay residential care plus diagnostic and therapeutic support services to a catchment population of 370 000. Healthcare is also provided within the state by private healthcare providers. The study was conducted between May 2016 and April 2017 and this time period included granting of ethical approval, a recruitment period of 4 months and follow-up. Ethical approval was obtained from the hospital’s Research Ethics Committee and the trial was registered at http://www.clinicatrials.gov, registration number NCT03067220. All patients admitted under the care of one surgical service (two consultants and seven non-consultant staff), either as elective or emergency admissions, over a 4-month period, were assessed for predetermined inclusion and exclusion criteria (table 1). If eligible for inclusion, patients were approached prior to discharge and the study rationale, randomisation method and potential methods of follow-up were explained. If they agreed to participate, an information leaflet about the study was provided and written consent was obtained. Any follow-up required before the OPC or VOPC review such as removal of sutures/staples or changes of dressings was arranged as usual via the local public nurse service or family doctor. Patients were randomised by members of the medical team who selected a non-transparent envelope, which contained either a coloured card indicating a VOPC follow-up by telephone call within 6–8 weeks or a white card indicating follow-up with an OPC appointment at 6–8 weeks. After randomisation, the patient was provided with a letter detailing their specific follow-up arrangements and a contact number was provided if they had any further questions after discharge. Patients were sent a further letter by administration staff after discharge, with the specific date of either the clinic appointment or phone follow-up. Data were collected prospectively on all admissions during the study period using a password protected Excel sheet. Information recorded included name, date of birth, chart number, date of admission and discharge, whether an elective or emergency admission, diagnosis, any procedure performed, result of randomisation and reason for exclusion if relevant. The surgical service delivered consultant led clinics two times per week. Patients attending the clinic were a mix of new referrals and review patients. Either a consultant or non-consultant doctor saw patients in order of arrival. All new patients seen were either discussed with the consultant or seen directly by them, as were all patients with difficult or complex issues. All review patients were seen and assessed by non-consultant doctors and only those reporting ongoing issues were then reviewed by the consultant. The VOPC was conducted by two non-consultant team members (senior house officer and a registrar) who had over 10 years postgraduate experience between them, over three afternoons per week for a period of 2 hours each afternoon. Administration staff retrieved the medical notes from medical records department prior to the clinic which was located in a room with access to direct dial telephones and hospital radiology, laboratory and pathology systems. This was achieved using existing resources and did not require any additional financial or technical support. On contacting the patient, the reason for the call was explained, any issues since discharge were identified and discussed and the result of pending investigations such as radiology or histology was explained. There was no standardised script and each doctor used their own approach to the conversation as they would in an OPC setting. The result of the discussion was documented in the medical chart and a letter dictated to their family doctor. If there were any ongoing issues or concerns or if the patient requested a clinic appointment, this was provided for at the next OPC where a consultant was available to review. For those who did not answer (DNAn) the telephone, there were two further attempts to contact them during the same clinic (one further call to their registered number and one call to their next of kin). If there was no contact, this was documented and a letter sent to their family doctor. A second evaluation was performed approximately 2 months after the final clinic review (VOPC or OPC) via telephone questionnaire to evaluate the overall experience of the method of follow-up and preferred method of follow-up in the future. This questionnaire also provided patients a further opportunity to report on any ongoing symptoms or complications of treatment. The primary outcome was the reported rate of complications or ongoing issues in either group at follow-up appointment after discharge. Secondary outcomes included a ‘did not answer’ (DNAn) or ‘did not attend’ (DNA) rate and the number of patients requiring further procedures or investigation. The final outcome was patient satisfaction with their experience, and the time and cost consequences associated with an OPC visit versus a VOPC clinic and the patients’ preference for future follow-up. Data were analysed with Stata Release V.15.1. Differences between groups on categorical variables were tested with the χ² test and on ordinal variables with the Wilcoxon Mann-Whitney test. Differences in rates are used to calculate numbers needed to treat. It was intended to use a 5-point scale to assess patient satisfaction with the assigned interventions. It can, however, be difficult to assess sample size requirements for such scales as the distributions are unlikely to be known in advance. However, we examined potential scenarios. Sample size was based on the premise that patients are unlikely to rate themselves as dissatisfied with care, so the majority of patients would use the fourth or fifth points on the scale, with a minority on the central point. A sample size of just over 100 per group was calculated to give 90% power to detect a difference between a 10%, 60% and 30% in the neutral, positive and highly positive categories and a distribution of 30%, 50% and 20% (using the R package sample size). A total of 365 patients were admitted for an elective or emergency episode of care by the service during the recruitment period. Of these, 209 patients were eligible for inclusion. After consent was obtained, 107 were randomised to telephone follow-up from the VOPC and 102 were randomised to OPC attendance (figure 1). Demographic data, type of admission and category of intervention by each randomised group are outlined in table 2. Of the 107 patients randomised to the VOPC follow-up, 98 (91.6 %) were successfully contacted of which 88 (89.7%) were discharged from follow-up while 10 had issues as outlined below. Nine of 107 patients (8.4%) were not contactable despite numerous attempts including attempts to contact next of kin. Based on available results, none of these patients required follow-up and this was communicated by mail to the last registered address documented on their previous admission and to their family doctor. Of 102 patients allocated to the actual OPC, 83 (81.4%) attended for their appointment, of which 67 (80.7%) were successfully discharged to their family doctor while 16 required further attention as outlined below. A total of 7/102 (6.9%) patients made an effort to contact the clinic and cancel their appointment saying they felt it was unnecessary and a further 12/102 patients (11.8%) DNA and did not contact the clinic to cancel. As randomised, there was no difference between the proportion of patients requiring further attention in the VOPC (10/107, 9.3%) and OPC (16/102, 16%, p=0.017, χ² test). Although the rate of issues requiring attention among patients who received a VOPC assessment was almost half of that in patients seen in OPC (11% vs 19%), this difference was likewise not statistically significant (p=0.150, χ² test). The difference in patient contact rates is statistically significant (p=0.030, χ² test). On the basis of successful patient follow-up, the use of VOPC gives a number needed to treat (NNT) of one extra patient follow-up for 9.8 patients assigned to VOPC. None of the 98 patients contacted via the VOPC reported complications of their management but six (6.1%) reported ongoing symptoms and were offered an OPC review the following week as per the study protocol. Of those six, only three attended; one reported a swelling at site of a hernia operation (normal examination), one had concerns about recurrence of a skin lesion (no recurrence) and one had ongoing rectal bleeding (booked for banding of haemorrhoids). Three patients DNA; two had reported intermittent pain and one had a suspected wound infection. The family doctor of these patients was subsequently contacted and confirmed that the two reporting pain they had not attended the practice for review and the third as treated with an antibiotic for a surgical site infection. A further four (4.1%) patients were listed directly for further procedures; one for sigmoidoscopy, one for surveillance endoscopy for Barrett’s oesophagus and two for surveillance colonoscopies for colonic polyps (figure 2). Reported satisfaction with clinic and doctor experience. OPC, outpatient clinic; VOPC, virtual outpatient clinic. Of the 83 patients who attended the actual OPC, 5 (6%) reported ongoing issues of which 2 were booked for CT/US abdomen for unexplained symptoms, 2 were referred to other specialties and 1 patient was booked for a further review in 3 months. A further 12 patients (14.4%) were listed for further investigations such as upper or lower gastrointestinal endoscopy. While 8/12 patients were booked for surveillance endoscopy for clearly documented reasons, there was no clear or apparent reason for these investigations being rebooked in 4/12 patients. The difference between cohorts in the number of further investigations/procedures requested, however, was not statically significant. The telephone evaluation conducted successfully made contact with 82/107 (76.6%) patients in the VOPC group and 61/102 (59.8%) patients in the OPC group. Six patients in the OPC group and 10 patients in the VOPC group reported ongoing, recurrent or intermittent symptoms. Patients in the VOPC group had higher satisfaction ratings (p<0.001, Wilcoxon Mann-Whitney test) with 95% of the VOPC group rating their overall experience as ‘very satisfied’ against 56% of the OPC group. No patient in either cohort expressed any dissatisfaction. The VOPC group also had higher satisfactions scores for their interaction with the clinician (p<0.001, Wilcoxon Mann-Whitney test) (figure 2). A majority of both cohorts, 41/61 (67%) in OPC group and 68/82 (83%) in VOPC group, reported a VOPC appointment as their preferred method of follow-up in the future (p=0.029, χ² test) (figure 3). Patient preference for future follow-up. OPC, outpatient clinic; VOPC, virtual outpatient clinic. Over half of patients contacted in the VOPC arm stated they would have had to miss either a half or full day from work if they had to attend for an OPC rather than being contacted by telephone. Attendees of the OPC also reported a mean waiting time to be seen of 49 min. A summary and comparison of the results of the questionnaire are listed in table 3. Following discharge from hospital, follow-up practice varies among surgeons. While some do not follow up standard procedures such as hernia repair, cholecystectomy or appendicectomy,8 others advocate routine follow-up citing the need to monitor patient progress, patient preference and family doctor concerns of increased workload.16 To our knowledge, there has been no definitive evidence to show that a no follow-up policy is safe and acceptable to patients or indeed evidence to suggest that a mandatory follow-up policy is necessary. 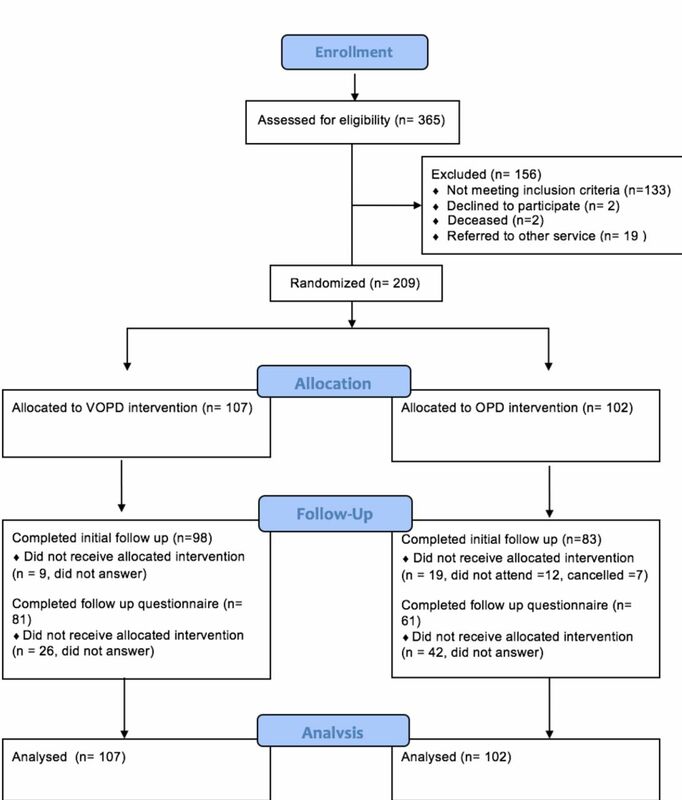 In order to address the variance in clinical practice among surgeons and to acknowledge patient and family doctor concerns, we conducted a randomised trial that has shown that a VOPC is a safe and acceptable alternative to clinic attendance for a broad range of general surgical patients following a hospital admission. Over 85% of all patients reviewed were successfully discharged and there were no issues identified that could not be dealt with by telephone. Of those requiring further investigations or follow-up in the OPC arm, the associated workload was mainly administrative. The cancellation and DNA rate for the real clinic was high, denying a significant number of new patients an assessment opportunity. Of note, a greater proportion of the OPC cohort were also uncontactable for the follow-up questionnaire. It is possible that the difference in follow-up rates is because people who have issues are likely to be compliant with follow-up while people who do not have issues are likely to skip their appointment. Skipping is more likely to happen if you have to attend OPD in person. An important point is that those who do not attend because they are asymptomatic may nevertheless have issues that are undetected unless they are interviewed, so the increased contact rate with VOPD is a potential benefit. The attendees of the real clinic generated more investigations including imaging or endoscopy compared with the VOPC which is difficult to explain. Perhaps, having attended for follow-up, paid for parking and waited for significant durations, patients required satisfaction and junior doctors found it easier to investigate further than to reassure. Those patients reporting any ongoing issues or symptoms in the VOPC were also afforded an opportunity to attend for a OPC assessment, examination and consultant review. Despite this, there was still a difference between cohorts. If required to attend the OPC, patients identified significant burdens to attending including absence from work, travel time to clinic and waiting time to be seen. The time from referral to review of new patients has been identified as a KPI target by National bodies in many countries.4 5 In the UK, the NHS constitution pledges that no patient should wait more than 2 weeks to see a specialist for a suspected cancer diagnosis or 18 weeks from referral to commence non-urgent treatment5 while in Ireland, the KPI requires that 85% of patients be seen within 52 weeks, but these KPIs are regularly exceeded.17 The demands on OPCs are such that 9% of patients wait more than 2 months for a specialist appointment in the USA.18 These demands place a significant burden on hospitals and clinicians to ensure an efficient use of available clinical resources. Various strategies have been implemented to improve the efficiency of outpatient services. A systematic review by Stubbs et al 19 has shown that interventions such as telephone or text reminders improve non-attendance rates. But reducing non-attendance rates, instead of improving access for new patients may potentially impair it due to increased workload. Clearly the best way to increase access to this limited resource is to reserve it for those who need it most. Although not examined in this study, based on a 2:1 return patient to new patient appointment policy, approximately 100 new patient appointment slots would have been created in the time period involved. While running the VOPC in this study took a significant amount of time, in addition to existing duties, the virtual clinic was conducted during time periods when the surgical team members involved did not have emergency or elective commitments. The virtual clinic could be run by a trained nurse practitioner with support from a clinician. In the oncology setting there is ample evidence that nurse led telephone follow-up is an effective method of delivering care.20 21 In the context of lung, breast and colorectal cancer, patients report a high level of satisfaction with nurse led services.22 Telephone follow-up has been examined in both adult and paediatric populations following anorectal surgery, cholecystectomy, hernia repair, tonsillectomy and following endoscopy1 6–9 12 and has been found to be a safe and acceptable alternative with satisfaction rates exceeding 90%.1 2 In this digital age, other and better technologies can be employed to enhance contact between patient and hospital such as text messaging,23 interactive voice response systems24 25 or web-based assessment tools26 or smartphone applications.27 We are now using the results of this study as the basis for a proposal to compare/ascertain the feasibility and safety of a text message follow-up and compare it to a telephone follow-up. Our study has a number of strengths. First, to our knowledge, it is the only randomised controlled trial to compare telephone follow-up directly with routine clinic attendance for a variety of general surgical patients. Only one other RCT compared telephone review with face-to-face appointment among postoperative patients but this was of a dental surgery practice. Unlike previous studies, we also included a broader range of patients, including those admitted on an emergency or elective basis as well as those who did not undergo a surgical procedure. Second, we also completed a further follow-up with both groups to assess overall satisfaction and to document any further issues. We acknowledge that the use of our follow-up questionnaire which was devised specifically to assess the outcomes of interest in this study and conducted 2 months after the initial review could be regarded as a limitation of the study. As such the questionnaire has not been previously validated, unlike the patient satisfaction questionnaires such as the 36 item Short Form Survey (SF-36)28 which has been validated. We felt that other available questionnaires were more useful in assessing overall satisfaction with many variables including other aspects of their care not relevant to the study outcomes. We also felt that these questionnaires were more suitable as a postal questionnaire follow-up rather than a phone follow-up. Any concern that a VOPC review at 2 months may lead to a delay in assessing potential complications is offset by the option of review at any time by the family doctor or the emergency department which was available to all patients regardless of the assigned intervention and by offering a next clinic review to all patients who identified or expressed any concerns during the VOPC review. While this study compared a VOPC review to a traditional OPC review, it did not perform a cost benefit analysis of delivering such a service. The main objectives of this study were to determine if a VOPC was a safe and acceptability alternate to traditional clinic follow-up, as to our knowledge this has not been established previously by means of a RCT. It should be acknowledged, however, that there were no extra resources employed or costs involved to conduct this study as all work was carried out by staff as part of their normal work commitment. Future studies may include a health economic analysis of delivering a VOPC compared with standard OPC. In conclusion, a routine follow-up visit for the majority of general surgical conditions may not just be unnecessary but results in delay in seeing new patients and may generate unnecessary further investigations. In this digital age a virtual follow-up should suffice, but the exact method, whether by telephone, text and so on and by whom remains to be determined. While clinical decision-makers must be involved a more efficient use of clinical personnel is mandatory for more effective clinical practice. This would result in a reduction in unnecessary appointments and should lead to greater efficiencies and timely access to outpatient services for newly referred patients. Future studies could evaluate the potential role of a nurse-led VOPC along with a health economic analysis of such a service. We would like to thank Professor Ronan Conroy of the Division of Population Health Sciences, Royal College of Surgeons in Ireland, Dublin, Ireland for his advice and comments in preparing the manuscript for submission. Health Service Executive, 2016. National service plan 2017 [Internet]. https://www.hse.ie/eng/services/publications/serviceplans/Service-Plan-2017/2017-National-Service-Plan.pdf (cited 6 Jul 2017). National Health Service. The Handbook to the NHS Constitution. Department of Health, 2015.
. Post-operative telephone review is cost-effective and acceptable to patients. Ulster Med J 2010;79:76–9.
. Outpatient laparoscopic cholecystectomy: home visit versus telephone follow-up. Can J Surg 2001;44:39–44. National Treatment Purchase Fund. Outpatient Waiting List. http://www.ntpf.ie/home/outpatient.htm (cited 6 Aug 2017). The Commonwealth Fund. International Profiles of Healthcare Systems. New York: The Commonwealth Fund, 2013.
. Evaluation of a nurse-led telephone clinic in the follow-up of patients with malignant glioma. Clin Oncol 2000;12:36–41. Monica 1776 Main Street Santa, 90401-3208 C, 2017. 36-item short form survey from the RAND medical outcomes study. Available from: from:https://www.rand.org/health/surveys_tools/mos/36-item-short-form.html (accessed 10 Nov 2017). Contributors PH drafted the proposal required for Ethical approval, was involved in data collection and analysis and drafted the main manuscript for submission. LMcC was involved in data collection, patient recruitment and data analysis. RT, EF and AF were involved in recruiting patients. CC performed statistical analysis of the data. RC provided advice to address some comments raised by the reviewers and this is acknowledged in the paper. MA was involved in drafting the manuscript. TW devised/proposed the project, supervised the staff involved and was involved in drafting the manuscript. Ethics approval Connolly Hospital, Blanchardstown, Dublin, Research and Ethics Committee. Data sharing statement No additional unpublished data.